Where Did Rachel Faucett Go After Being Released from Prison Following Her Extramarital Affair? 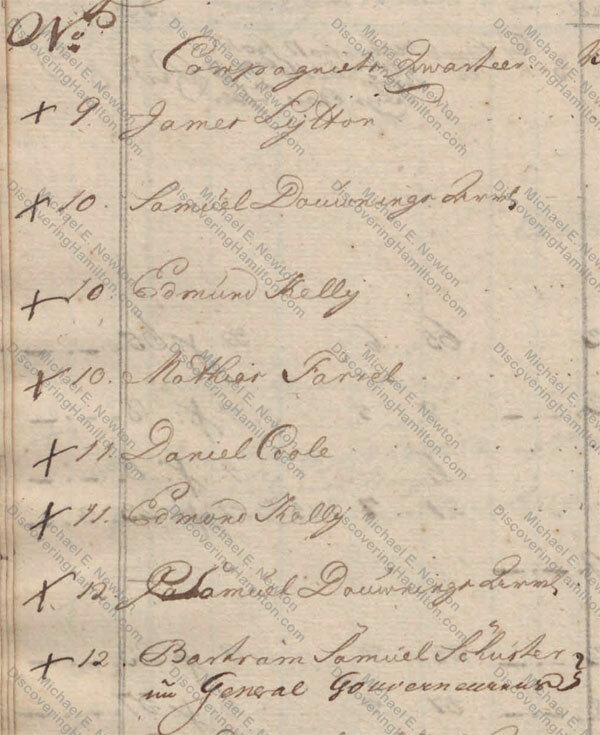 As noted last week, after spending nearly eight months in prison for “fornication,” Rachel Faucett Lavien, the future mother of Alexander Hamilton, was “freed…from jail and lawsuit” in May 1750 upon her husband John Lavien’s request because he thought “that everything would change to the better and that she, as a wedded wife, change her unholy way of life and…live with him.” Despite her husband’s expectations, Rachel left the island of St. Croix by year’s end. Where did Rachel go after her release from prison but before leaving St. Croix? 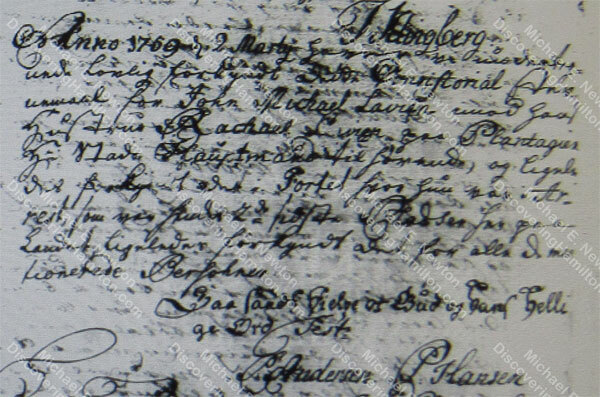 Also noted last week, John Michael Lavien filed for divorce from his wife Rachel Faucett in February 1759. Accordingly, Hamilton biographers have reported that Rachel Faucett Lavien went to live with Bertram Pieter de Nully on his plantation after her release from prison. Thus, based on the text of the divorce proclamation, Hamilton biographers explain that Rachel was released from prison and then went to live “with” Bertram Pieter de Nully on his plantation. 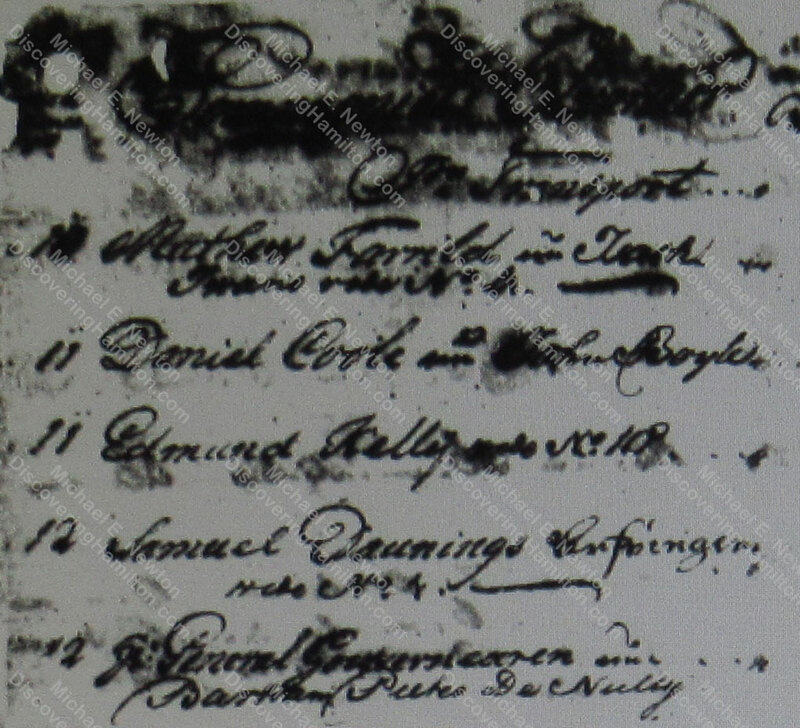 It just so happens that one of the estates owned by Bertram Pieter de Nully in 1759, that is No. 12 Company’s Quarter, was owned by John Michael Lavien, husband of Rachel Faucett, from 1745 to 1750. Thus, in proclaiming the summons in March 1759 “on the plantation owned by the Town Captain,” the court did so on Bertram Pieter de Nully’s plantation No. 12 Company’s Quarter because it had been the home of John Michael Lavien and Rachel Faucett Lavien back in the 1740s and thus was one of Rachel’s “two last places of residence.” The divorce court was not saying that Rachel had ever lived with Bertram Pieter de Nully, but rather that her previous place of residence was now owned by that gentleman. But the matrikel for 1756, compiled in April 1757, shows that by this time de Nully had acquired these plantations. Thus, Bertram Pieter de Nully did not acquire Nos. 12, 20, and 21 Company’s Quarter until 1756 or early 1757. 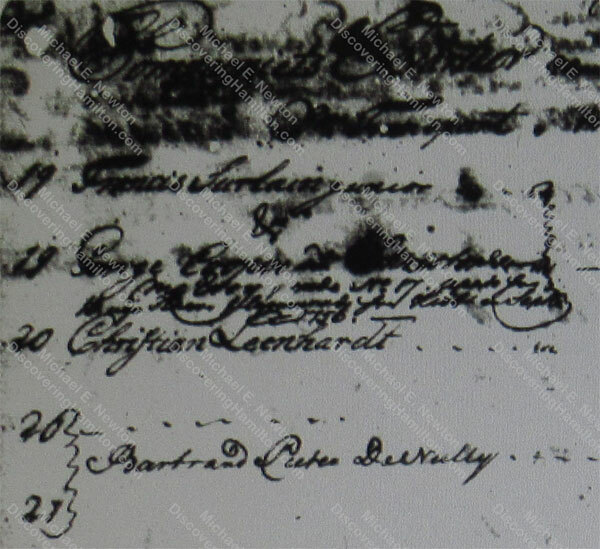 Accordingly, Rachel could not have stayed with Bertram Pieter de Nully at his Catharine’s Rest plantation back in 1750 when she was released from prison because he did not even own that property yet! 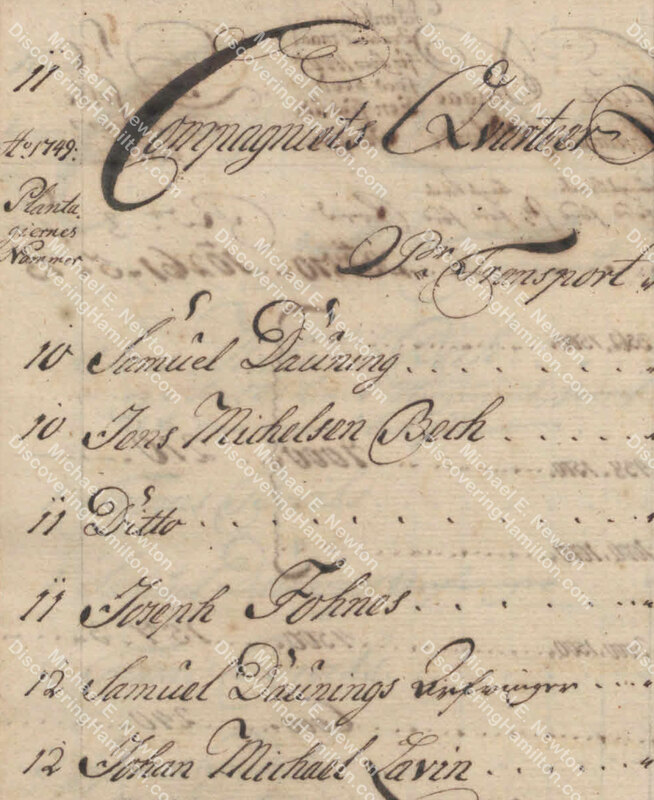 Hamilton biographers are therefore incorrect in stating that Rachel went to live with Town Captain Bertram Pieter de Nully at his Catharine’s Rest plantation, or any other plantation he may have owned, after her release from prison. Rather, the divorce summons was proclaimed on de Nully’s plantation in 1759 because he had by that time acquired No. 12 Company’s Quarter, which back in the 1740s had been one of Rachel’s “two last places of residence.” Rachel did not live with Bertram Pieter de Nully after her release from prison and there was no connection between Rachel and de Nully back in 1750 or at any other time. Where Did Rachel Faucett Go After Being Released from Prison? While this debunks the story that Rachel had gone to live with Bertram Pieter de Nully after her release from prison, it does not tell us where Rachel went. Unfortunately, there is no positive evidence regarding where Rachel went after being released from prison on May 4, 1750. Perhaps she went to stay with her sister, Ann Lytton, at No. 9 Company’s Quarter, later known as the Grange. Or maybe she stayed with a friend. Or she could have rented a room for a short time as she made arrangements to leave the island. Or perhaps she headed straight for the docks and took the first boat off of St. Croix. Or maybe she left St. Croix with Johan Cronenberg or possibly met up with him after they each left the island separately. Unfortunately, despite all the new discoveries relating to Alexander Hamilton and his mother Rachel Faucett, much remains unknown and perhaps unknowable. 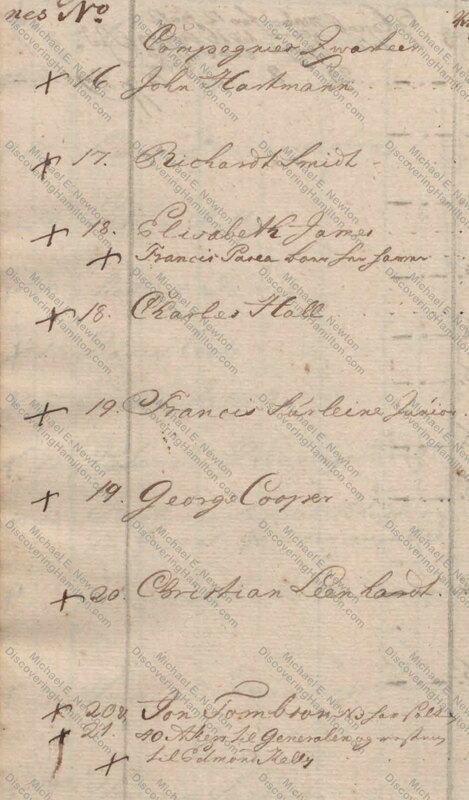 This blog needs your support to stay online and to continue the research into the life of Alexander Hamilton, his family, friends, and colleagues. Mitchell, Alexander Hamilton: Youth to Maturity 7–8. Flexner, The Young Hamilton 14 and 50. 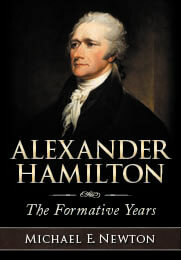 Randall, Alexander Hamilton: A Life 14–15. © Posted on July 30, 2018, by Michael E. Newton. Please cite this blog post when writing about these new discoveries. Next Next post: Where did Mary Uppington Faucett Live on St. Croix?